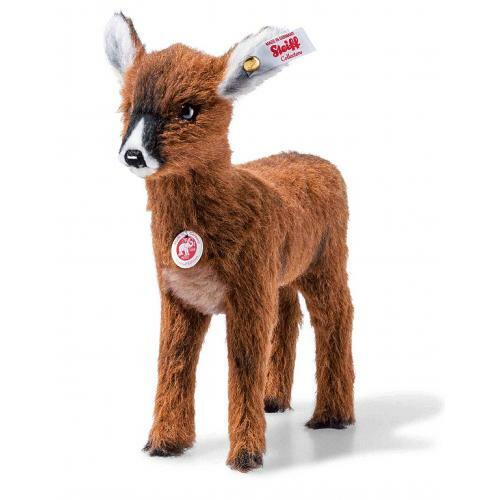 Hinda Doe by Steiff. 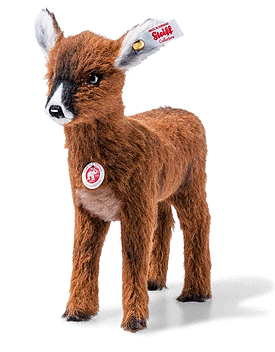 A beautiful limited edition Steiff item, hand made in russet alpaca. Product details: non jointed, safety eyes, synthetic filling material, size 22cm. Comes boxed, together with a numbered certificate of authenticity. Who is that out in the glade? A graceful wild animal with a friendly demeanour and no antlers. It is Hinda, the proud doe. Measuring 22 cm in height and with a golden “Button in Ear”, she will be roaming through our forest 1,000 times when springtime comes, keeping a close eye on her herd. You can recognise Hinda from her large, gentle eyes, her light brown stomach and her black and white inner ears.